So… I don’t know about you, but the whole “Daylight Savings Time” has really been messing with me – especially today. Maybe it was just because I worked on a Monday for the first time in a long time or that I went to bed super late because I was completing an assessment for the second round of a job or whatever, but I felt really dead mentally almost all day long. Kind of absurd. I spent the evening baking, and wanted to share the recipe with you through pictures but, alas, we don’t have quite the right input/output cord for the newest/old camera that we borrowed from my parents this past weekend. The fact that I took pictures of the process is completely useless with no cord. Regardless, I have another recipe I’d like to share. We adapted this out of Great Easy Meals‘ “Mix & Match Foil-Packet Fish,” which I’ve mentioned a few times. This was an incredible meal, people. Man. Really simple, too. I mean, I guess it wouldn’t be great if you don’t like or are allergic to fish, but for everyone else = fish-tastic. Essentially, you take four 4-oz fillets of salmon (I bought a pound of salmon fillets in the frozen food section at Walmart for $5, and they come individually wrapped, of all things), put them over some veggies, wrap them in a piece of foil, and bake them for a while. For ours, we used about two cups of veggies. 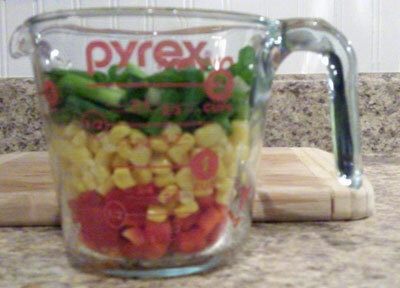 Instead of choosing two types of veggies, as the instructions state, we went with three: 2/3 cup each of green onion, corn (from a can), and red bell pepper. This is also a little less than the instructions state (2 cups total instead of 4), but it was plenty and entirely sufficient for adding good flavor to the salmon. To the veggies I added 1/2 cup chicken broth and 1/2 fresh lemon juice, stirring it all together with some salt, pepper, and a few leaves of freshly shredded basil. 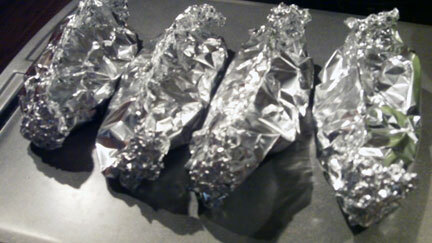 Bake the foil packets at 450° for 12 minutes, until they’re cooked through. Remove from the oven and let them rest an additional 5 minutes. I put ours over a simple flavored rice mix (I think it was Herb & Butter Rice a Roni), and just flipped the packet upside down onto the rice – fish first, then veggies on top. It was an amazingly flavorful and healthful meal. 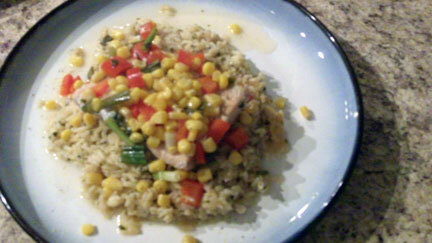 Only about 525 calories, even with the rice (fish and veggies alone – 275 calories).